That Jessica Seinfeld and her new cookbook Deceptively Delicious (tm)* have nothing on me. I've been hiding vegetables in Chup's food for years now. Just last week I smuggled a broccoli puree into his bowl full of Cinnamon Toast Crunch (tm) and he thought nothing of it. Him: Honey thanks for the green syrup on my cereal again! Me: I like my man healthy! 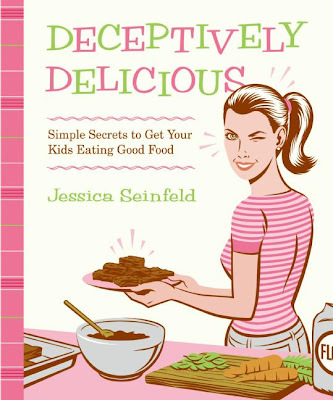 You know JessSein was on Oprah(tm) and then suddenly every American(tm) in the world wanted to deceive their children too so they all bought her book. Because I was brilliant enough to figure the whole process out WITHOUT her book, I was more stunned by her cute wardrobe. I think she should write a book entitled Deceptively Darling (tm) because who knew that Jerry Seinfeld(tm) could marry so well? He deceived us all! By-the-way, Chup thinks I watch too much Oprah. Him: Darling, you watch too much Oprah! Me: Is that even possible?! Anyway, I don't remember the last vegetable I ate. Maybe lettuce on a taco. I used to be such a diligent vegetarian. Now spend most of my days with a VitaminWater (tm), a slightly green banana and a handful of peanuts (unshelled.) I am NOT trying to deceive you here, it's a good meal. But remember those brownies that Jessica made for Oprah, the same ones that Jerry said he'd eat for his last meal, the same brownies that contain spinach and carrots? Oh yes those ones! Well click on over to Jamie's blog (tm) because not only did she make them, she reviewed them and posted the recipe. * By-the-way (tr) is trademark. I don't want to get sued by nobody. I mean, I don't want to get sued by nobody! P.S. I have insomnia. What is your remedy? And please don't say a half-cup of cauliflower puree in my bedtime mug of warm soy milk. I'd rather not sleep.